You know those days where you just want to dress up, even if you aren't going anywhere special? That was Saturday for me and this outfit was the result. After working at a restaurant all day covering in orange juice and in a T-shirt and tennis shoes, I felt pretty gross and just needed to put something on that was girly. 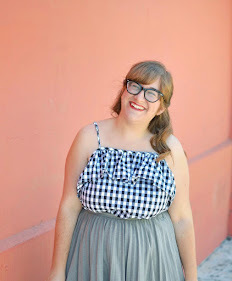 This Dear Creatures dress is one of my favorite pieces that I own (I was lucky enough to get it as a stylish surprise from Modcloth), but for some reason it's hardly shown up on the blog. 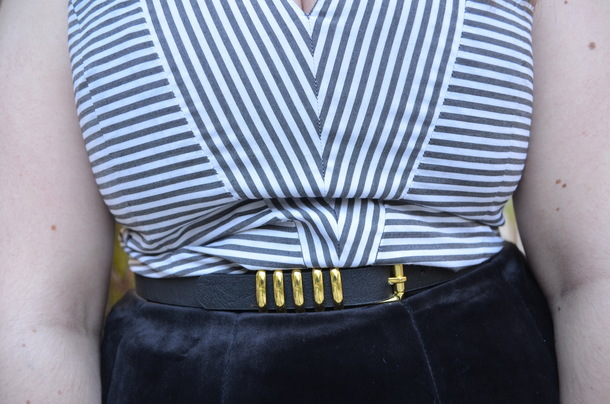 I had never thought to wear it as a top, but it felt like the perfect match for this thrifted velvet skirt. I ended up just wearing it to get dessert with my friends Adam and Jeremy, but it was exactly what I needed. Lesson learned: Dear Creatures makes everything better. I don't have too much to say today, which is probably a first for me. I'll make sure to make up for it next time when I find something to ramble about. Oh my goodness, that skirt is just so perfect! Sometimes you just need to look extra fabulous! Hope you had a fantastic weekend! Man, Elana, you look so good. I love your hair all straight and chic looking! And that dress and skirt are basically a match made in heaven. You got my stamp of approval (don't lie, I know you wanted it)! This dress is so gorgeous!!! I love the mix of velvet and stripes, the back of the dress looks absolutely amazing too. Sometimes it's so fun to just dress up but not be doing anything! Haha, I'm so with you on having to wear something dressy after work! Usually I close though, so I have to switch to jammies after my shift. Ah well, this Dear Creatures dress was perfect with the velvet skirt. I love the back of it! I know that feeling all too well and I love this look! The back of that dress is SO CUTE! And I love your hair straight like this! Hello, look at you in your pretty velvet skirt! Verrry nice, girl! Elana, this is so pretty! I love the back of the top (aka dress), and that silhouette of this is so lovely. And is that a cameo ring?! I've wanted one for a while! Pretty pretty. That dress is so cute! I love the little bow in the back:) Looks great with the velvet skirt, it can be so fun to dress up sometimes. That dress/top is SUPER cute - love the bow detail! love the velvet. i am so obsessed with velvet lately! it has such a classy vintage look, in my opinion. you pull this off so nicely! Geez, you TOTALLY lucked out with your stylish surprise! I really love this outfit, the back detail really is the best part. Oh, and that ring is super cute. Haha I'm guessing you were never friends with my blog Facebook because you've always been friends with my personal one. No harm done! That dress as a top is, in a word, perfect. 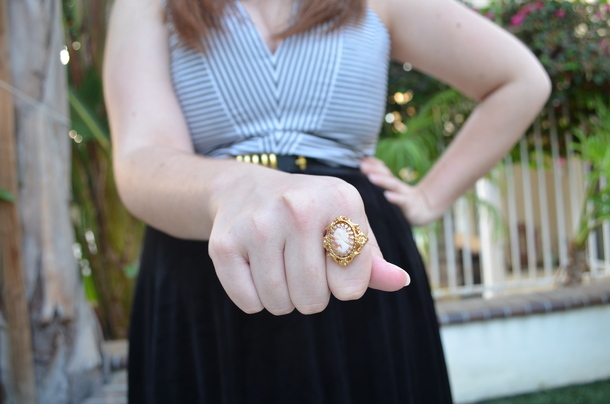 Plus, I love that pairing of a cameo-ring with it. You look so lovely and I'm still lovin' your new cut. Isn't it funny how the small things make a difference? This dress looks great as a top! I just love the shape of the back and the adorable bow. 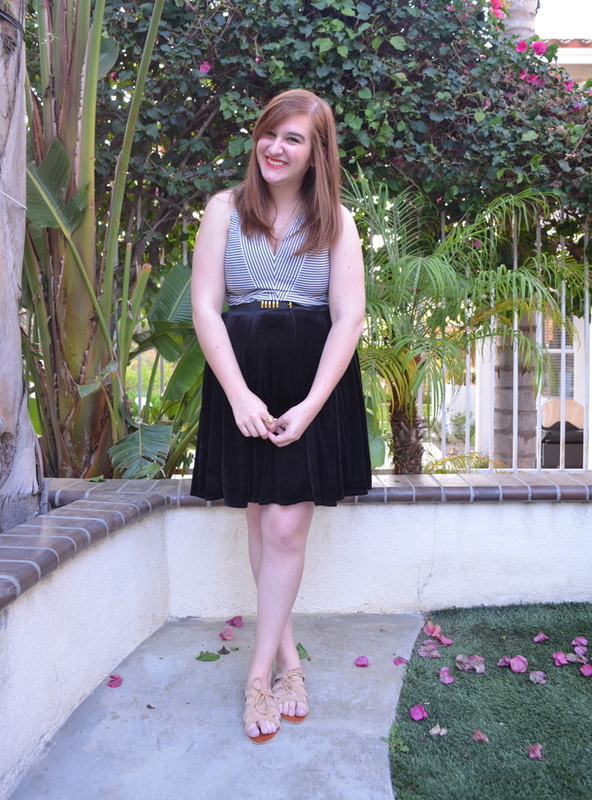 Your thrifted velvet skirt is fantastic too! I need to find one like that! LOVE this. That skirt is such an amazing thrifted find! When I try to wear dresses as tops I end up feeling super awkward about the layering/keeping everything in place. I don't know how you manage to make it look so perf everytime! Can we have a post about that please? !